Signs4U, located in Ede, is a privatly owned company which is specialized in building and installing in- and outdoor signs for Casino's and Arcades. With the experience of our team they can offer a solution to every demand. 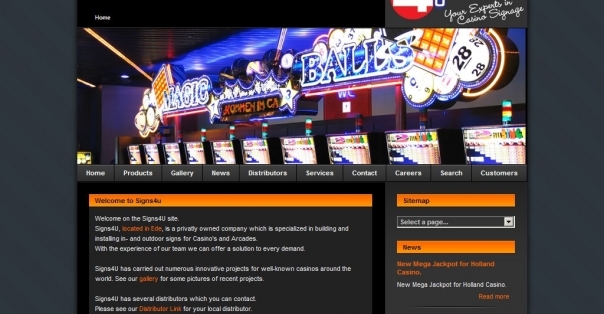 Signs4U has carried out numerous innovative projects for well-known casinos around the world. See our gallery for some pictures of recent projects. Signs4U offers a wide variety of signage that can be used in conjunction with Mystery and Progressive jackpots. The facts speak for themselves. Casino operators who use the latest technology to create an attractive gaming environment for their players achieve additional time on machine or table and generate higher revenues. SIGNS4U is the unchallenged leader in the art of combining advanced technologies to produce a ’player friendly’ atmosphere in casinos, large or small. Signs4U has a suitable solution for every possible application in the area of signage.